What makes a hurricane? When the ingredients needed to make a hurricane come together perfectly, the end result can be intense storms like Katrina, Harvey, Irma and Sandy capable of causing immense destruction in their paths. Hurricanes are among the strongest and most devastating natural disasters on earth, but the average person knows little about how they form. In this article, we’ll dive into the basics of a hurricane’s anatomy. This is a general term for a warm core storm system with a closed circulation that forms over tropical waters. Tropical storms, hurricanes, and typhoons are all types of tropical cyclones. A hurricane and a typhoon are the same thing, but are named differently based on where they occur. An intense tropical cyclone in the Atlantic and eastern Pacific is called a hurricane whereas it is called a typhoon in the western Pacific. In the Indian Ocean, they’re simply called cyclones. A tropical cyclone has a well-defined center and rotates counter-clockwise in the Northern Hemisphere and clockwise in the Southern Hemisphere. This difference is due to the rotation of the Earth and is a phenomenon called the Coriolis Effect. 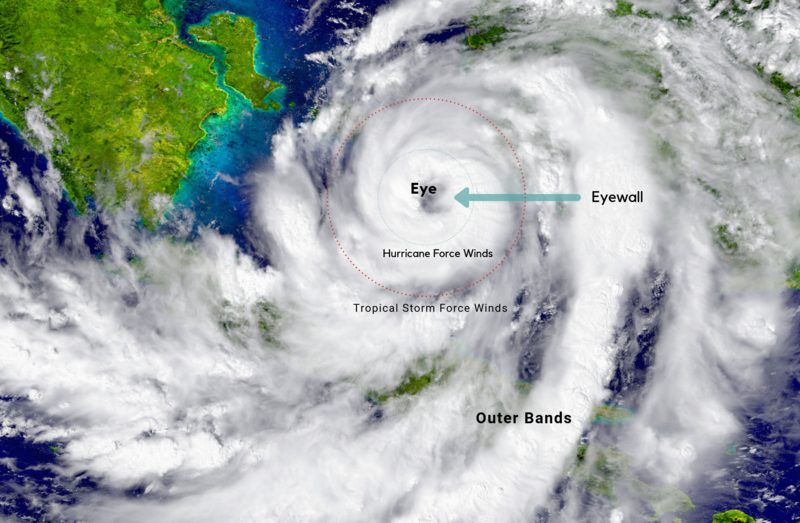 We refer to the center of a hurricane as its “eye”. The eye typically measures 20-40 miles wide and can actually be the calmest part of a storm. While a 20- to 40-mile diameter is typical, the eye can range from as small as 2 miles to as big as 200+ miles. When the eye of a storm is overhead, blue sky or stars can often be seen. The size of the eye often determines the strength of the winds in the eyewall. Generally, the smaller the eye, the stronger the winds. Just outside the calmest part of the storm is the most dangerous and strongest portion of the storm known as the eyewall. This is where you’ll find the strongest winds within a hurricane. The winds decrease substantially as you move away from the storm’s eyewall. The fact that the calmest and most intense parts of a tropical cyclone are right next to each other leads to an incredible contrast as a location experiences both within minutes of each other. Storm surge refers to the rise in sea levels during a tropical cyclone or major storm where the height is calculated by the difference between the current sea level and what the water level would be without a storm present. Storm surge is more severe on the right side of the storm with respect to its motion in the northern hemisphere due to the storm’s rotation leading to onshore winds, causing ocean waters to pile up along the coast. Areas with a shallow continental shelf (e.g. the Gulf of Mexico) are more susceptible than areas with a steeper continental shelf. Spiral rainbands are the areas of turbulent weather that rotate around the tropical cyclone’s center of circulation. Heavy rainfall and strong winds accompany the passage of a spiral rainband. The weather is calmer in between the rainbands. Tornadoes sometimes occur within spiral rainbands, though they are typically small and short-lived. In order for a hurricane to form, at least two things must be present. An existing low pressure weather disturbance needs to move over warm ocean waters. Hurricanes thrive on warm water and will typically only form when water is above 80 degrees Fahrenheit. The combination of warm air and warm water allows a hurricane to develop. Other favorable ingredients for a tropical cyclone are humid air and low vertical wind shear, which is the change in wind velocity with height. This scale is used to measure how strong a hurricane is. Below are the categories used to classify a storm based on its sustained wind speeds. Hurricanes are some of the most dangerous and destructive natural forces on the planet. It is important to understand them in order to better prepare for their impacts when one is threatening.